Roughly 5 out of every 100 grown men will experience a heart attack at some point in their lives. If I opened my fortune cookie, and the fortune slip gave me the unfortunate task of choosing between the two right now, clearly (and probably a bit reluctantly), I would choose the former. Realistically, I will never have to face that dilemma … partly because I can’t control my own fate; and mainly because I refuse to eat fortune cookies after acquiring food poisoning from the sushi at China Palace Buffet three months ago. But unfortunately for Notre Dame fans everywhere, we are burdened with a predicament much too similar to this one. You see, we are a divided fanbase solely because of two people: starting quarterback Everett Golson and backup quarterback Tommy Rees. Golson, a native of South Carolina (much like Tony Rice), has all the intangibles of being an elite quarterback. He’s got a gun of an arm; he’s quick, agile, and mobile; he’s accurate. And above all else, he’s young and teachable. Halfway through the season, he is undefeated as a starter and has shown glimpses of greatness. He’s electric and burdens defenses with the possibility of making a big play every time he touches the ball. But, as Coach Kelly would say, he’s a “heart attack player.” He is a freshman. And rightly so, he has a hard time reading defensive schemes and movements; he’s reluctant in making pre-snap adjustments; and he even sometimes has a hard time understanding our own offensive plays … which ultimately results in about 4.3 million heart attacks across the nation. The first time we saw Golson take the field, though, he hardly looked like a quarterback who had never played a down in college before. He commanded the team to a 50-10 win against Navy while posting a 141.09 QB Rating. Though you could argue that both quarterbacks have similar passing stats each time they start (despite one being a freshman, and the other being a junior), no one, and I mean no one, can deny the fact that Tommy Rees represents “death” in the above scenario. Unfortunately, nobody has discovered a cure for death, yet. And what’s worse, is that nobody has yet to discover a cure for Tommy, either. Tori Spelling once admitted, “that [she] was always cast in movies doing something athletic, even though [she] can’t even do a cartwheel.” Elwood, it’s time for Tommy to stop acting and to step aside. It’s time for death to lose its sting. I will gladly take Golson’s intermittent fumble mixed in with a few 20-yard runs over a flat-footed statue who lies comfortably 6 feet below. Death is synonymous with destruction and ruin. And that’s where Notre Dame has been for the last twenty years … just going through the motions … not developing players … settling for less. This year was supposed to be an extension of that … a year for the team to develop amidst the hardest schedule in the country. This was supposed to be a time for our team full of young talent to soak in the experience. This was supposed to be another down year leading to 5 or 6 wins. But, under the direction of Everett Golson, Notre Dame has been lifted out of its deep grave and is, once again, among the nation’s elite. Heart attacks yield a 75% recovery rate. In other words, after Golson escapes the closing pocket, tears off for a first down, and occasionally hands the ball to the opposition, we can all breathe a little easier knowing that he will lift us from that grave! He is a freshman, but he has the ability. He will learn. He will improve. And we, as the Notre Dame fanbase, will recover. Jake… Where do I begin? For starters, grow a pair. You can’t let some bad sushi scare you away from fine dining that is a Chinese buffet. When I go to a Chinese buffet, they refer to me as El Diablo! And, yes, I know that is Spanish, but that just means I probably need to choose a classier location to eat at. This is where I’m supposed to give you a rebuttal argument and tell you how much better the offense is while Rees is under center. Well let me tell you something: momma didn’t raise no fool (actually she did, but my sister is another story for another time). The simple truth is that we aren’t better as an offense with Rees under center. Don’t get me wrong: Tyler Eifert would probably set every tight end record known to college football if Tommy was the full time quarterback, due to the fact that is the only read he ever makes. As much as I like Tyler, our team is more important than his stats. You know, it is not often I say I agree with you, but let’s be honest for a second. If Tommy had faced the kind of pressure all year that Everett has faced, and mostly escaped from, he would be dead as a door nail. His lack of mobility would cause him to take more punishment than Harry & Marve in Home Alone 1. In this age of mass media coverage of sports and information sharing, everyone on the Internet has become a coach. No one seems to look at the logistics of football anymore; they only second guess the results if they do not fulfill their expectations. I am a member of several Notre Dame Football websites, and in general we have a pretty knowledgeable fan base. As with any fan base, though, there are the real trolls. When I read on some forums people arguing for Tommy Rees to be the starter, it simply blew my mind. But to see some people take it a step further and say that he could win a Heisman Trophy as our quarterback if we were undefeated??? To borrow a line from the “E-Trade Baby”: Tommy would have a better chance of being mauled by a grizzly bear and a regular bear in the same day. Let me say right now that I am a not a fan of the two quarterback system, but Tommy Rees has won games for us, and for that I thank him. With our offense though, the quarterback has to have at least some mobility, even if he is not what is considered a “Dual Threat.” If Tommy could not outrun the South Bend PD … he has no chance of escaping a pocket. If anyone needs to be under center whose last name is not Golson, it needs to be Andrew Hendrix. We should use him the same way Oklahoma is using Blake Bell, especially in the red zone where Golson has to face smaller windows to throw and run in. 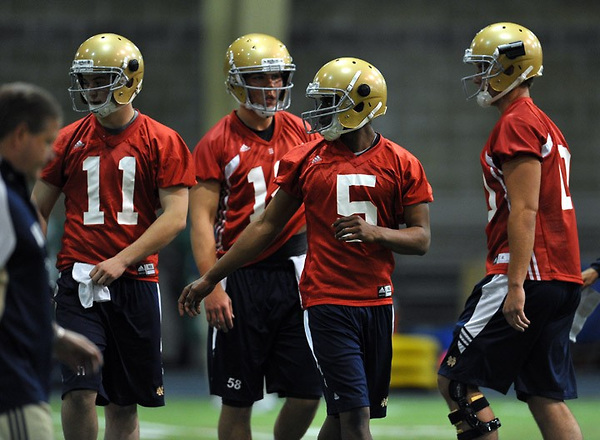 The only concern I have with Golson are his mistakes. His late play calling is on the coaching staff, as Tommy had the same issues. A rolling pocket will also help him, as we have already seen him succeed in that setting this year. However, his mistakes leave me scratching my head sometimes. Hopefully he will grow out of that, but I have seen plenty of quarterbacks make those same kind of mistakes as upperclassmen, not just freshmen. I have been, though, fairly pleased; and hopefully the playbook will open up a bit more for him as the year goes on.